"More minimalist effect" in the maximalist market! When we went to the supermarket in our last trip to London, we've noticed that, "Our packaging project could go to next level". This second edition has one more variation and now, we are showing all brand names with simple text & same font, without logo or corporate sign on it. The font is Helvetica Neu Bold. Our question is similar with the question in our first post! What is your choice in these 4 different variations? P.S. This project is only a design practice for showing minimal feeling of some international samples. It is an article about unnecessary items on the global brands, any of them, second, third or fourth variations are not new packaging proposals! It feels to me, at least the majority of the time, that the 3rd option is the best. It portrays just enough of the brands character to be pleasing, but not too much excess visual information that its overwhelming. The exception this though would be the Guiness and the Polo. Both of those look better at their 2nd iteration. There's just too much missing for me once you hit the 3rd versions. often the "more simple variation" suits best, because it would be to generi without a logo. 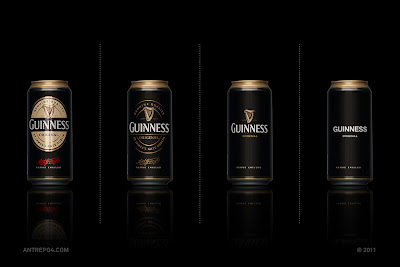 but in some cases, for example guinness, evian or duracell the no logo variation fits better. My preferences are different for each brand. Tobasco: #2. For whatever reason, I just enjoy (or perhaps expect) front-facing decals on condiment bottles. However, I think the ones on the neck are overkill and cheapen it. 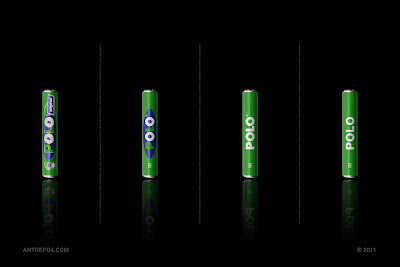 Polo: Design-wise, I like #2, but #1 makes it more apparent what type of candy it is, so I feel it's the more effective choice. 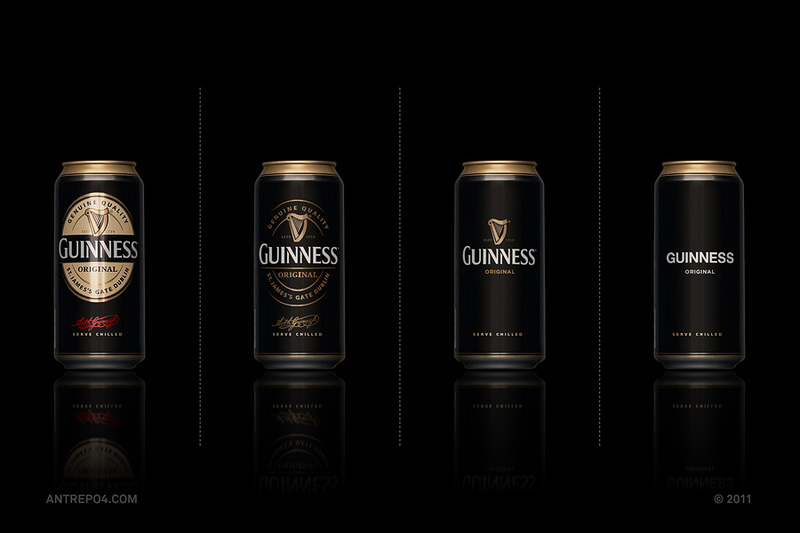 Guinness: Again, I prefer #2 because it's simple but still elegant. Guinness has too much of a history to reduce its image to a line of text—the white space actually cheapens in this instance. Although, the red text on #1 probably helps to draw attention to it in a liquor store setting. Evian: #3. Water sells itself. It doesn't need dressing up. I don't purchase bottled water, but if I did I wouldn't buy one in a bottle with warm colors on it. The Helvetica is too simple though; makes it look like a knock-off. M&M's: This is the most interesting one to me. I'd say the package depends on the context in which it's being sold. If they're being sold next to kids' products, I'd go with #1, because not only are there identifiable characters on it, but it also shows them exactly the kind of M&M's they are, as opposed to relying on just text which could easily be overlooked. For adults, I'd pick #3, because it lacks cartoons but still has the same familiar branding, which manages to appeal to both sophistication and fun. #4 I would only like on a healthier, alternative snack food, because it not only has that same sophistication, but contrasts strongly with typical candy packaging. 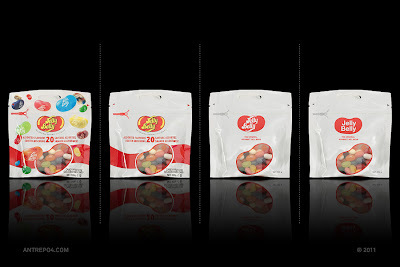 Jelly Belly: #2 has just the right level of excitement. #1 is way too busy, but #3 & 4 look almost clinical. 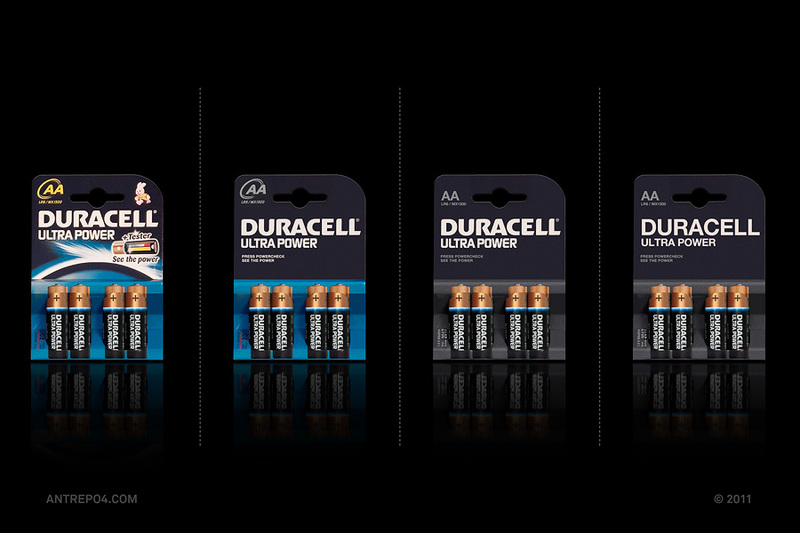 Duracell: This is a tough one. I like the background image of #1, but the foreground has too many distractions. At the same time, #2 doesn't say "energy" to me as much without the electric imagery, which also makes the blue loos some of its meaning. In #3, the font seems too heavy for the rest of the package. 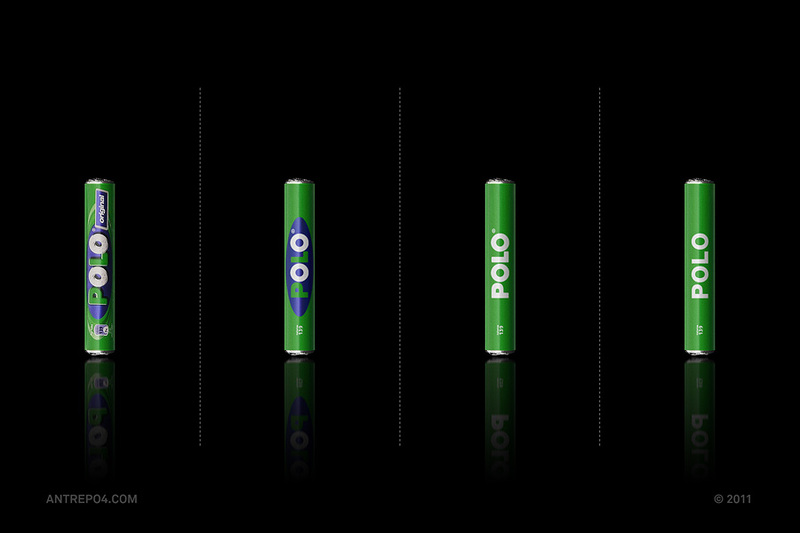 #4 is therefore visually appealing, but it's no longer apparent that these are different from standard batteries; "Ultra Power" could easily be interpreted as a tagline. If they cost more, it could be a smart, if deceptive, move to increase sales, although that's assuming consumers are more likely to go for regular batteries than supercharged ones, which may not be the case. Smint: #2 isn't bad, but the breeze in #1 complements the iceberg nicely, driving home the "chilling" aspect of it, which I'm guessing is a selling point of the product. 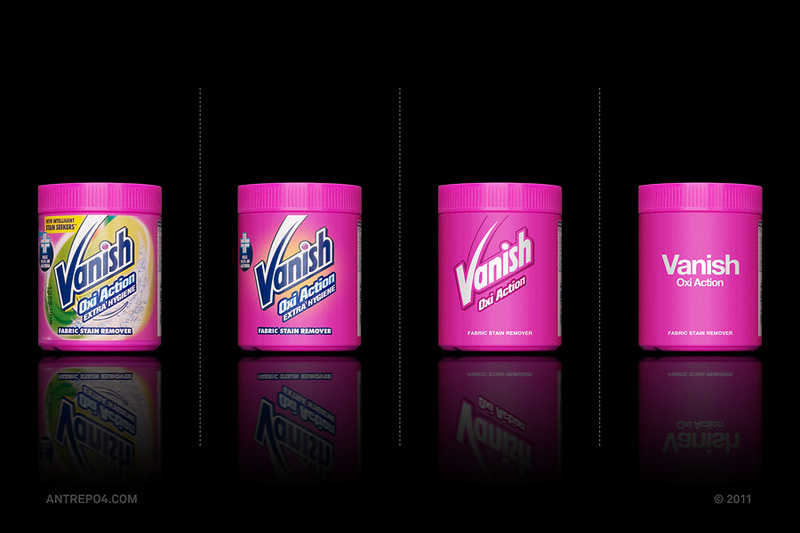 Vanish: I can't stand the combination of colors in #1, but the suds make it more apparent that it's a stain remover. I'd assume this would be sold alongside other stain removers though, so if you can rely on context, I like #3 the best. 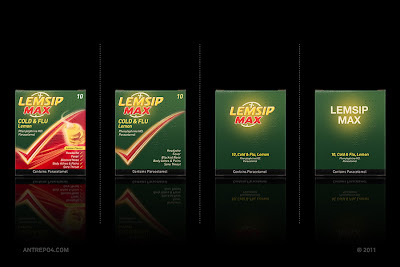 Lemsip: Again, I don't like the color comibnations. That said, #3 is the most visually attractive; it's very straightforward and I feel that if you're sick, you shouldn't have to scan the entire box for information. At the same time, not everyone knows what they have and may just be looking for a cure to a particular symptom than the entire ailment, so I think #2 is the best compromise. Well Done!!! I prefer the minimalist version for most of them especially for Evian. I guess that the minimalist can be efficiant only for people who already know or use the brand. Preferred the most minimalist in most and the 2nd to most minimalist for guiness, m&m, and Jelly Belly. i really enjoy this series. i think generally the #3 is my sweet spot. enough embellishment to set apart and have character but not too much noise distorting the signal. You've come up with such a nice minimalist concept. 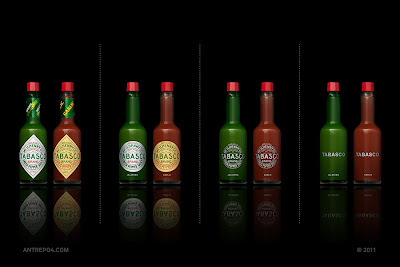 The Tabasco bottle and its label have a timeless design. Your minimalist take is great. My answer is 4 in all the cases. All number 4s loose to much of the brand character. While I agree that many times "less is better" the no-logo options are flat out retarded. I'm surprised people on here actually prefer them. 3 is the way to go. Although Polo and Lemsip are probably nicer on the second iteration. works especially well for the evian bottle. Nice Work, this designs are better than the originals! 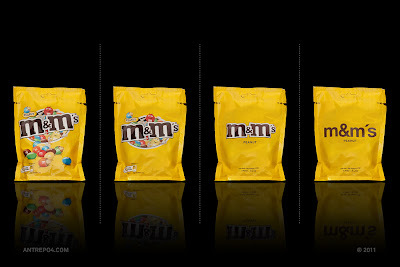 the fourth looks so much more clean and classic in nearly all of them, imagine if you went to the store and bought a bag of M&Ms that looked like that, life would be so much simpler and we wouldn't have such an issue with childhood obesity either. I like the first or the second one on most of them. The 4th options are usually void of any character and look like government issue or Dharma Initiative type stuff. Id pretty much every time go with the 3rd option. They have just the right level of uncluttered appearance, but still with that little something that the brand marks bring to the product. 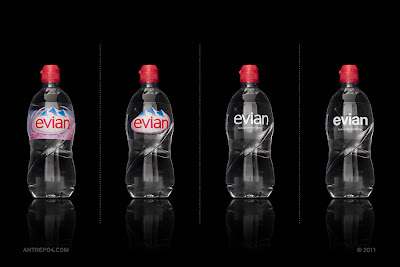 In the case of evian, the 'simplified' 4 actually looks more complicated than the no.3, just because there is very little difference in way of font type used. 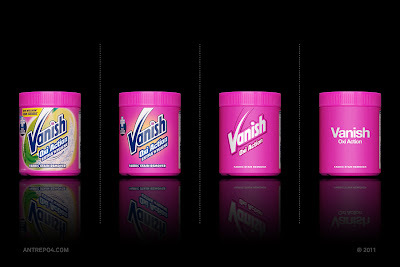 The only one I prefer no.4 on is the vanish tub. The exceedingly bright pink of the packaging makes the utilitarian nature of the type work well, and really, the vanish brand is basically all around that pink. i love these re branding concepts. the minimalist outlook of 4 i do find constantly appealing however it wouldn't be attractive to many businesses because the simplicity is at the expense of brand identity. if you where to find a way of incorporating the simplicity of #4 with the iconic brand identity's of #2 it would be more appealing. i think this is particularly applicable to Evian Guinness and smint. but leave polos the way they are i LOVE polos #4 that being said every single Tabasco option is exceptionally well designed. good work! The 3rd always is my favorite ! I love minimalism, but I'm not sure for the public opinion. It'll be interesting to show this project to common people and here what they think and like the most. I like the 3rd version on all of these samples. 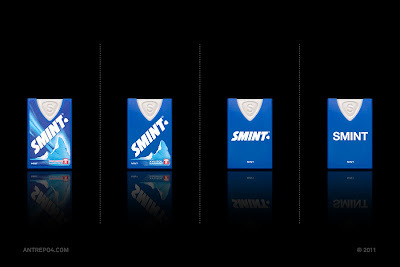 The 4th is to generic with no brand identity. I think consumers would bypass a generic option. Brand identity is lost without a variation of the companies logo. You reduced everything to Helvetica. WHY? That should be a type crime equally frowned upon as using Comic Sans. I can't believe it but I'm actually offended. A great design experiment! It helps remind me that the same treatment can't be applied to every product/market. Sometimes you have to consider more than what you know is good design--you have to consider the audience. Fantastic. I have to say I prefer the 4th iteration in just about all of them. In keeping with the minimalist vibe. Nuff said. It's great to see that even with the products logo replaced with a simple typeface the 'brand' still remains through visual identity and colour..some better than others but great idea guys, awesome work! What if these weren't brands that everyone in the world knows? Would a simplistic package still be effective? Everyone knows what "m&m's" are, but I probably more than bare-minimal styling on, say, my own MonthlySauce.com startup (since no one's heard of it). I agree about 3 being best in most cases. I think 4 would work for Guinness if it was written at the top of the can in a slightly bolder font - it would actually look like a pint of Guinness without even having to try. Can you answer yourself why choosing Helvetica for everything? Please stop assuming Helvetica is the best of designing, it is just a fail-safe typeface. Just like leaving the house unpainted and think that it was so beautiful. Be creative. the extreme minimal is very compelling for many. Too many people are afraid to exercise restraint and end up complicating their brand. Other brands do well to take it a step further and embellish their logo a bit more. Many brands look infinitely more sophisticated with the 4th option, others look more old fashioned or retro (the Jelly Belly one is a fantastic example of the retro). I am not a fan of the M&M logo, it's familiar.. but the second I saw the 4th option, it made me think more about eating chocolate than mascots and noisy commercials. Interesting. In most cases I tend to prefer variation 2 or 3. Simplified, but not completely generic. Amazing how far you can go towards minimalism and still have the brand recognizable. I agree that most work best in step3, while some (duracell, smint, evian) I'd like in the logoless state. Great how you captured colours and proportions to keep some of the brand feel..
Why? clear and still saving identity. I would go for number 3 and 4 in most cases. I really like the minimalist design you have created for these products, but as you state this is a design product and not a new package proposal. although the minimalistic design appeal more to me in design, the number 1 and 2 is better for branding and commercials simply because they are eye catcher. I wish my whole life was filled with No4...less is more. I think 4th version of Duracell and Jelly beans could be even more simple. But anyways, awesome work! Really shows how overwhelming are commercials these days and that simplicity is just so relieving. Thanks for your work! Im awfully curious as to what these would look like without text or product names but just logos. As for me simple variation is better in all cases! It's a wonderful idea, to minimize the graphics and present products in its very basic nature. Thought I do personally find the 3rd choice more appealing than the 4th, (on a general basis) as in the 4th case, using a common font and style for all products has brought out a rather unimpressive look on the whole. People are likely to bored of it after some time. Another contradiction here is the fact that businesses all over spend a huge amount of funds, for the very purpose of achieving a look, that only attracts the consumer, but also induces them to buy the product. If they follow the 4th option as brought out here, the very essence of it all is likely to get lost along the way. I'm against the fourth option since it changes the original font suppressing the feeling evoqued by it (which also help us to know what is the product about). it looks like a pirated version or like a generic statal service. may as well write "state water" or "state beer" (in fact, it would be way better... maybe with the brand's name below it). the third options are my favorites, but in some cases it doesn't give enough clues about what the product is (like the m&m's or smint). in those cases, it should be like the second model. Number 3. As many here have said, it retains enough brand character but adds much needed refreshment. My only exceptions would be Duracell, as I think the blue is not obtuse but quite integral to the product's appearance, and the signature on Guinness adds heritage.